Learn to Play in 30 days! 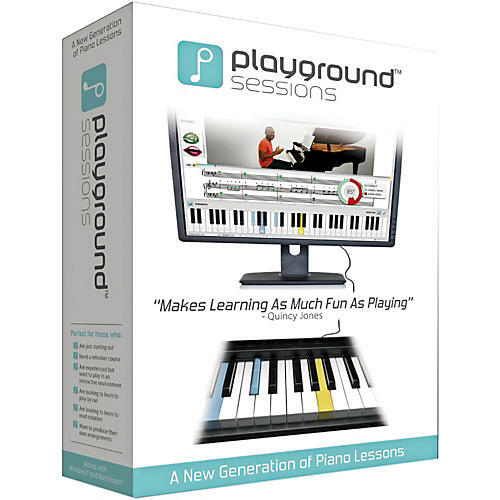 Playground Sessions is a revolutionary software platform that teaches you how to play the piano using popular songs you know and love. Perfect for all levels, Playground has hours of interactive video tutorials starring music phenomenon David Sides teaching songs and music theory. You'll learn to read notation through "Apologize," find your way around the keyboard with "Hey Soul Sister," and master rhythm with "Because of You," all with instant on-screen feedback, bringing the best part of private lessons to your own home. Walk through our interactive video song tutorials step by step with your teacher, award-winning musician David Sides. As the song progresses, the on-screen keyboard will highlight the notes you should play in real-time, simultaneously mirroring what David is playing on the piano. It's an innovative, easier way to learn. Learn on your own time with the convenience of a teacher available 24 hours a day. Plus, no song can be too intimidating with David's supportive feedback and tips guiding you through. Practice with instant visual feedback so you know right away which keys you've played correctly and incorrectly. This helps you see where things are going well and where things need work. At the end of each section, you will receive an accuracy report and a score, motivating you to practice more. Playground translates your progress into easy-to-read graphs and charts so you can see where you're improving over time and where more practice is needed. Earn badges for your accomplishments, try to beat your high score, then proudly display and share them with friends. Playground lets you pick songs that inspire you the most. When you love the tune and know the rhythm, it's easier to learn. So before you know it, you're already playing. Choose from top hits such as "Halo", "Imagine", and "Moonlight Sonata". Song lessons are arranged by level of difficulty: Rookie, Intermediate and Advanced, so no matter your level of experience, we've got the perfect song for you. Quincy Jones' career has encompassed roles of composer, producer, arranger, artist, instrumentalist¦ As producer and conductor of the historic "We Are The World" recording and Michael Jackson's solo albums, Off The Wall, Bad and Thriller (the best selling album of all time), Quincy stands in a class of his own. True to his passion, before partnering with Playground he recently founded the Quincy Jones Musiq Consortium for the purpose of improving the availability of music education for children. Playground Sessions is supported by both Mac and PC as long as your computer meets the minimum requirements outlined below. It is recommend that you use a MIDI or USB keyboard in order to take advantage of the interactivity of Playground Sessions, including real-time feedback, scoring, badging, and progress visualization.